This is documentation for the Viper RAM Expansion by Alternative Engineering Corporation. 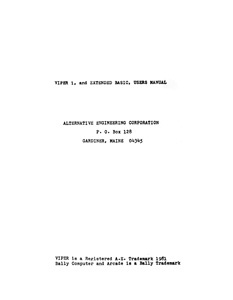 Manual with explanations of such features as the Auto Write Switch, Checksum Program, Copy Cartridge Program, Copy Extended BASIC from Memory to Tape, Glossary of Computer Terms, Internal Dual Switchpaks for Memory Addressing and Bus Controls, Keyboard Interface, Loading Extended BASIC from Tape, Programmable Write Protect/Write Enable Circuit, Switched AC outlet, Troubleshooting, Installation, and Viper to Bally Interface Card. Compared to the preliminary manual (below), this manual has several extra pages. This could possibly be the released version, but there is no way to tell for sure. Preliminary and possibly a draft manual might be useful, so they are archived here. Viper 1 and Extended BASIC User Manual (Preliminary) - 15 pages. Retyped. Viper 1 and Extended BASIC User Manual (Possible Draft) - 10 pages. OCRed scan. This five-page document is the product announcement for the unreleased Viper Z-Grass expansion system. The system would have included 64K RAM, 32K Z-GRASS ROM, 2 RS232 bi-directional communications ports, 81-key full-stroke keyboard, Intel 8231 high-speed arithmetic processor unit, 2 2000-baud cassette interface ports with motor control, 2 Double Sided/Double Density 5 1/4 floppy disk controller, expandable to high resolution graphics mode (320 x 204, color), memory expandable up to 256k, stereo output jacks for the 3 octave music synthesizer and compatible with CP/M operating system. With over 10 years of custom software development, plus the most advanced hardware features ever offered on a home computer, the Viper Z-GRASS system has become the most powerful, yet affordable Video Image Processor on the consumer market. This unique system together with the Bally/Astrocade Professional Arcade has a total of 8 microprocessor devices including 3 original Bally/Midway custom graphics processors (used to make such videogame legends as Pac-Man, Galaxian, Wizard of War, Space Invaders, and many others). Many other home computers can play arcade games, but the Z-GRASS computer system is the first machine specially designed for writing them. Z-GRASS makes it fun and easy to create your own arcade games, video art, graphs, charts, synthesized music, plus special sound effects. Almost everyone has ideas for video games but only now with Z-GRASS can you put your thoughts in motion without having to be a master programmer. "Viper-ZGRASS System" Product Announcement - Text Format. 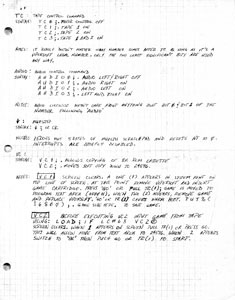 One-page of handwritten Vipersoft commands with descriptions and usage notes. The commands listed are TC (Tape Control), AUDIO (Audio Control Command), MUZSTOP (Music Stop), and VC (Volume Control). 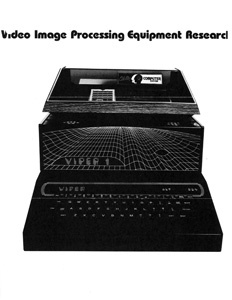 The cover of this pamphlet says Video Image Processing Equipment Research. 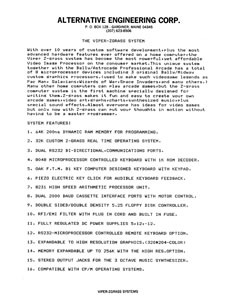 This four-page document has specifications for the Viper System 1, 16K Memory Expansion for the Bally Arcade/Astrocade. 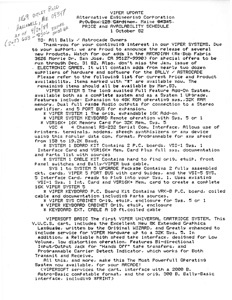 This two-page letter to "All Bally/Astrocade Owners" has new products announcements and prices for Bally Arcade / Astrocade Viper System 5, Viper System Keyboard, System 1 Board Kit and Vipersoft BASIC. The products are described and prices are given for both assembled products and kits that users can build themselves.